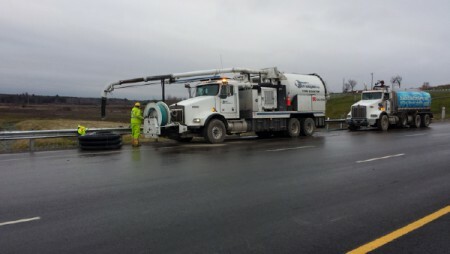 Cleaning and Flushing - Sewer Technologies Inc.
With our advanced, state of the art Cleaning and Flushing trucks, Sewer Technologies is able to provide high pressure cleaning and vacuuming of wastewater collection systems, storm water drainage systems, lift stations, manholes, catch basins, etc. We are able to clean pipes ranging from 100mm to over 2400mm. Our specialized sewer cleaning machines are able to release water pressure of approximately 75 gallons per minute into the manhole. The water begins to flush out all the debris lodged in the pipe then the air vacuuming system will draw all of the dislodged debris into a large debris tank. Productivity is increased with Sewer Technologies combination cleaning and flushing truck, as larger debris and water tanks mean less time filling and dumping and more time cleaning the sewers. Our crews are equipped with all of the specific cleaning nozzles, hydraulic reamers and milling cutters required to remove any foreign object including debris, gravel, roots, calcite, concrete, solidified asphalt, and other objects. With our CCTV assisted Hydraulic Reaming services, Sewer Technologies Inc. crews are able to remove various obstructions from pipes including, grout/cement products, calcite and roots. Our Vac trucks are equipped with all of the various rotating hammers, cutting heads and milling machines and will select the most suitable solution based on the job specific requirements. A CCTV truck will monitor this process ensure that there is no damage inflicted to the host pipe. Our remote controlled robotic precision cutters can solve problems of intruding connections, exposed gaskets, heavy calcite deposits and root masses. This robotic cutting equipment allows for total flexibility, reliability, efficiency and precision which are all extremely important for cutting applications and removal of obstructions. Our various robotic cutters can be used in both laterals and sewer mains. Sewer Technologies Inc. was formed as an Ontario Corporation in 2002 and consists of a unique blend of professionals with a diverse range of skill sets in both management and technical areas.